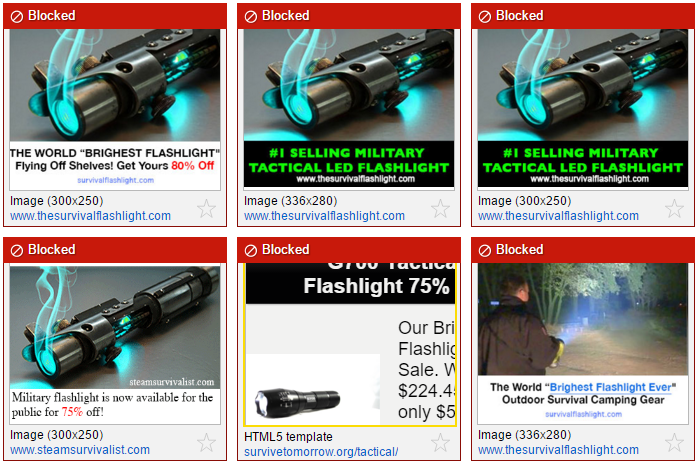 Several readers have pointed out the irony that sometimes when I do an article on the flashlight scammers, the ads for the scam flashlights appear on my site, right alongside the article. It’s very frustrating because Google Ad Words tries to connect people with what it thinks they are searching for. So what I have to do is go through all the thousands of ads that Google wants to serve up on my web site, and block them one by one. I don’t know many sites that do this. Most sites are more than happy to serve up whatever Google gives them. And what’s worse, Google is the least shady of all the ad networks. Since there’s not many ways a web site can support itself, I’m pretty much stuck with Google. Lately I’ve been blocking every ad network whenever I see one of those scammy flashlight ads. The problem is that they create and launch new ads faster than I can go through them, and that’s why they sometimes appear on my site. Sometimes it seems like a losing battle. Hopefully they can’t create new ad networks that fast, and the less scammy ad networks will refuse to run their ads. I have knowledge that this is already happening. The biggest scammers are still in business but feeling the heat, and one even posted a vague legal threat in the comment section of one of the articles. I know who they are, and they know who I am, so this should get even more interesting over time.